・ Jespersen, Otto. A Modern English Grammar on Historical Principles. Part 2. Vol. 1. 2nd ed. Heidelberg: C. Winter's Universitätsbuchhandlung, 1922. Some scholars believe that the Lancastrians actively promoted the cause of English in order to increase their appeal to merchants and commoners against the aristocrats who were the leaders of the rebellions against them. Even if this is true, it is not likely that the kings would actively promote a standard as such. Ab test they would encourage the use of English as the national language, but this in turn would enhance the prospects of a standardised variety of London English being adopted as the variety to be used nationally. In order to follow this policy, the kings would have to rely on the forms of language most accessible to them, and that meant using one of the standardised forms of English used in the Chancery or some other government agency. From 1400 onwards the idea that there should be a single form of 'English' based upon the language of London and its environs became predominant. a head. a tounge. a body. a hat or cap. teeth. a buttocke. and so on through a list that includes 120 terms. ・ Blank, Paula. 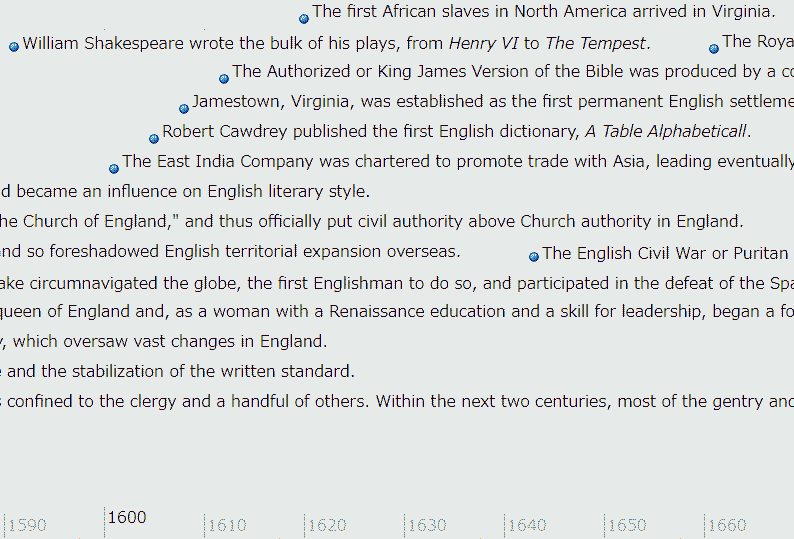 "The Babel of Renaissance English." Chapter 8 of The Oxford History of English. Ed. Lynda Mugglestone. Oxford: OUP, 2006. 212--39. One great misfortune to which the Public are liable, is, that Thieves have a Language of their own; by which means they associate together in the streets, without fear of being over-heard or understood. The principal end I had in view in publishing this DICTIONARY, was, to expose the Cant Terms of their Language, in order to the more easy detection of their crimes; and I flatter myself, by the perusal of this Work, the Public will become acquainted with their mysterious Phrases; and be better able to frustrate their designs. In making these attacks Dryden is possibly the first person to select examples of the language usage of others and arbitrarily assert that they are intrinsically incorrect. To prove his points, Dryden attempted to find observable evidence in his opponents' texts. The problem was that he did not know enough about language to do this properly, and consequently from a linguistic point of view his remarks are ill founded. Nevertheless he did successfully establish the convention whereby people without any special knowledge of language feel entitled to assert that some other people have failed in the acquisition of their mother tongue. (1) "the shift from information-structure-oriented word order in Old English to 'syntacticized' order in Middle English; this in tern led, at the end of the period, to new strategies for marking topic and focus in special ways." (2) "the development of auxiliary verbs in contexts where implied abstract temporal, modal, or aspectual meanings of certain concrete verbs became salient"
(3) "the appearance of a large set of new discourse types, from romances to drama, scientific writings, and letters"
・ Traugott, Elizabeth Closs. "Middle English: Pragmatics and Discourse" Chapter 30 of English Historical Linguistics: An International Handbook. 2 vols. Ed. Alexander Bergs and Laurel J. Brinton. Berlin: Mouton de Gruyter, 2012. 466--80. Chancery English has a precursor in the form of English used by Henry V's Signet Office, the king's private secretariat which travelled with him on his foreign campaigns. It is significant that the selection of the variety which was to develop into what is generally referred to as the Chancery Standard originated with the king and his secretariat: the implementation of a standard variety can only be successful when it has institutional support.
. . . the case of Henry V possibly reflects not so much a decision made by an enlightened monarch and his council as political and practical motives: by writing in English, Henry first and foremost identified himself as an Englishman at war with France, while at the same time seeking to curry favour with the the English-speaking merchants, who might be prevailed upon to finance his campaigns. Politeness as face work may thus not have played a major role in Anglo-Saxon society. This highlights the intrinsically culture-specific nature of phenomena like politeness and suggests in accordance with other cross-cultural studies that the universal validity or significance of politeness theory --- as devised by Brown and Levinson . . . --- is a gross mistake. Negative politeness in particular is fundamentally culture-specific, reflecting the typical patterns of today's Western, or even more particular, Anglo-American, politeness culture . . . . The study of Anglo-Saxon pragmatics thus does not only affect our understanding of the historicity of verbal interaction but also challenges issues of universality. Historical sociolinguistics was launched more than a decade earlier than historical pragmatics . . . . The focus is on the extent to which change in language is conditioned by the social factors identified as characterizing the dataset. In recent years, historical pragmatics and historical sociolinguistics have converged. If for example a recent definition of pragmatics by Mey . . . is taken as the point of departure, "[p]ragmatics studies the use of language in human communication as determined by the conditions of society", the difference between historical sociolinguistics and pragmatics disappears altogether, and pragmatics is always "socio-" in the European broad view of pragmatics. This reflects the European tradition; in the Anglo-American the difference is still valid. The convergence is also acknowledged by the other side as "sociolinguistics has also been enriched by developments in discourse analysis, pragmatics and ethnography" . . . . The overlap is clear and some subfields of pragmatics, such as politeness and power, are also counted as subfields of sociolinguistics. A recent trend is to deal with politeness (and impoliteness) through speech acts in the history of English . . ., but it is equally possible to take a more sociolinguistic view . . . . The two disciplines have very similar topics, and titles of talks in conference programs are often very close. Further evidence of the tendency to converge is the emerging new field of historical sociopragmatics, which deals with interaction between specific aspects of social context and particular historical language use that leads to pragmatic meanings in understanding the rich dynamics of particular situations, often combining both macro- and microlevel analysis. ・ Jucker, Andreas H., ed. Historical Pragmatics: Pragmatic Developments in the History of English. Amsterdam/Philadelphia: Benjamins, 1995.